A couple of weeks ago, we went to Mars Cheese Castle right over the border (to buy cheese - of course! )and on our way back home, we visited the home of a blogger in Lake county, IL with chickens. Our Little Coop, a blog about a local family who is trying to be more self-sufficient. 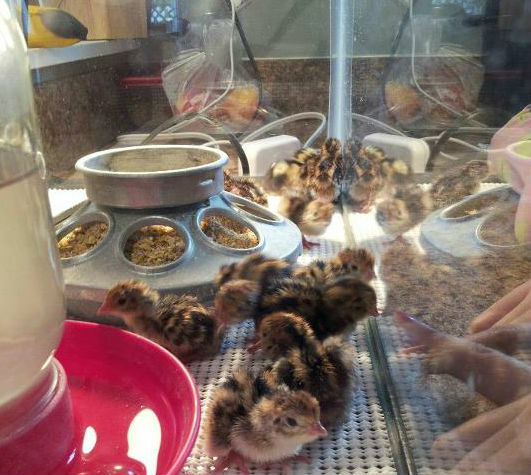 They have Chickens, Coturnix quails, and Cayuga ducks on their 1/4th of an acre. After only five minutes, we knew we were cut from the same cloth. We talked about canning, and how we stared down this path, and the adventures it has taken us on including my recent plea to the village to allow backyard hens as a sustainable practice. 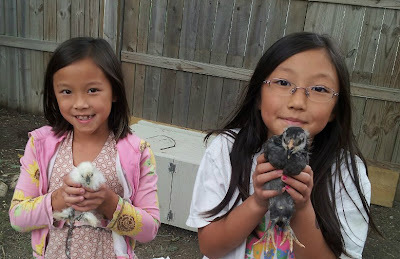 "...attempting to transform our 1/4 acre of land into a backyard suburban farm and homestead. With two small children, twelve chickens, two ducks a few handfuls of quail, vegetable and herb gardens, fruit bushes and trees, we always have something going on around here! Our goal from the beginning has always been to get back to basics, simplify life, reconnect with the earth and each other and above all show people that no matter how small their backyard or space, everyone is able to become more self sufficient and experience the joys of growing and creating. Our hopes are to share with you the knowledge that we acquire along the way and that we make a difference, however small in the lives of others!" Here are my girls holding a Silkie Bantam on the left, and a... ....a.... oh what is that one on the right. It'll probably come to me at 3am. The silkie bantam is always a joy to see, because they are true "fuzzy chickens" where the feathers look like Angola rabbit hairs. I have no idea how they see out of those feathers! The rest of their backyard had some raised garden boxes with vegetables. 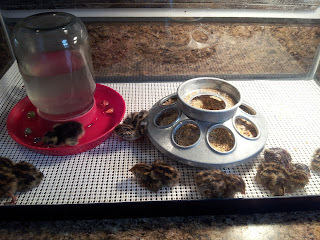 They also bred all sorts of rare and fun quails for hobbyists. 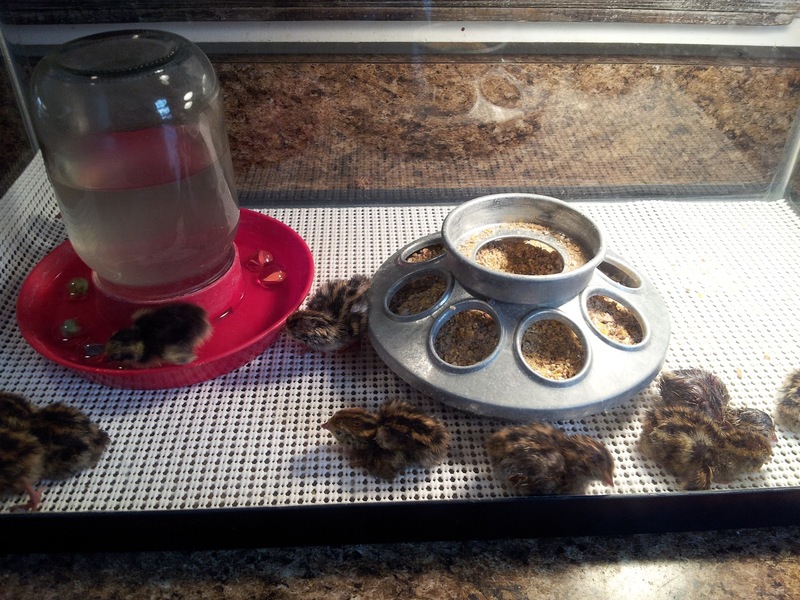 As it just so happened, our timing was just right to see baby coturnix on the hatch! Born that day, they were as small as a silver dollar. Aiiiiieeeeeeee!!!!!! who could resist these cute little fuzz balls?!?!?! The dad of the family (Kevin) runs his own HVAC company, so if you're looking for someone local when your AC goes out, or your heater needs work, here's a fellow homesteader and backyard poultry lover you could give some business to! http://www.ourlittlecoop.com. Not a paid plug - Just loving on my fellow human! All in all, it was a great time. My kids didn't want to leave,and loved playing with their son and daughter. Coming from a town that doesn't allow backyard hens, I couldn't help but be a bit envious. Imagining what life could be like, I jokingly asked if the home next door was for sale. They said it actually would be put up for sale soon. To quote Shakespeare, "tempt not a desperate man!" Those fuzzy babies! So cute!